Among Shakespeare's numerous stage characters, probably none has been so variously interpreted as the 'savage and deformed slave' Caliban in The Tempest. For nearly four centuries, widely diverse writers and artists from around the world have found the rebellious monster an intriguing and useful signifier. He has been portrayed in the theatre and in literary criticism as - among other things - a fish, a tortoise, the missing link, an American Indian, and an African slave. He has also appeared extensively and diversely in poems by Browning, Auden, and Brathwaite among others, and in illustrations by Hogarth, Fuseli, Walter Crane, and other major artists. In the twentieth century, he has been widely adopted as a cultural icon, especially in the Caribbean, Latin America, and Africa: first as a symbol of imperialist North Americans, more recently as an emblem of colonised native populations. Shakespeare's Caliban looks first at the historical, etymological, literary, and folklore contexts in which Shakespeare created Caliban. The authors weigh the plausible intellectual influences of early Jacobean England and reach a tentative conclusion about what Shakespeare may have had in mind. 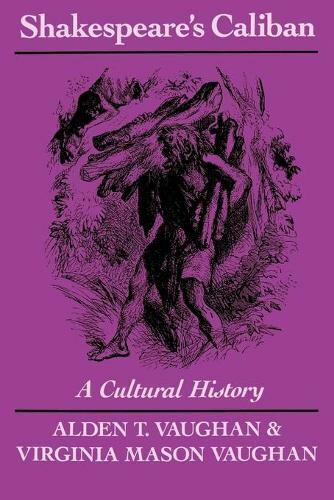 The rest (and far larger part) of the book traces Caliban's evolution from his first appearance in 1611 to the present, with chapters on the major artistic genres in which Caliban has been interpreted, appropriated, and adapted: criticism, stage, painting, poetry, film, and sociopolitical literature. Shakespeare's Caliban relates the monster's changing incarnations to the cultural and intellectual forces that allowed him to reflect major trends - including romanticism, Darwinism, the late nineteenth-century Anglo-American rapproachment, and the Third World liberation movements after World War II. "This is a quite exceptionally sound and illuminating piece of scholarship. It takes a single revealing and well-documented piece of litmus paper, the figure of Caliban in The Tempest , and tracks it through history and geography, literary criticism, theater, book illustration and painting to give a comprehensive and detailed account of the huge changes in the ways it has been seen and interpreted. In doing so, it provides not only a piece of cultural history but a test for some of the most basic shifts in ways of thinking about mankind through the last three centuries. Its history covers not just English and American thought but Spanish American, Caribbean, and African. It is an interdisciplinary study of the best and most rewarding kind. It is a beautifully worked out and immaculate thesis, and an admirably readable book." Andrew Gurr, University of Reading.